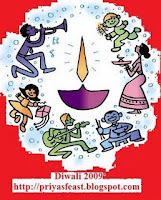 Happy Diwali My Dear Friends! Hope you have a wonderful and prosperous and sweet year ahead! Speaking of sweets, what were the sweets at your place this year? My in-laws are visiting us this year. So, we split the Diwali workload between the both of us! My mother in law is making all the savory snacks this year and I’m making all the sweet dishes. She's already made ribbon pakoda, mixture and mullu murukku. Yummy stuff! I'll upload the pictures soon. When I think of Diwali sweets, its always Badusha, Jangiri, Ladoo and others. I remember we used to pack a little of everything in plates and then walk over to all our neighbors and give them sweets. And they would dump all our stuff into their plates and fill up our plate with their stuff! You could so say how some sweets were recycled between neighbors! LOL! Here’s my step by step Badusha recipe. This time I tried to do the regular badusha and also wanted to try the layered badusha. But, really there was not much difference. Once the cuties got fried and dipped in sugar syrup, who cares if they had layers or not! Nuts for Garnish – I uses Pistachios. You can use whatever you like! Take the 2 cups maida in a mixing bowl. Add 1 tsp of Baking soda to the maida. Add the ¾ cup of ghee to this and mix well. Don’t knead it into a batter. Just mix well. Add the 1 cup of fresh curds and mix again. Once again, don’t knead but just mix well. I added a little more maida – maybe about 1 tbsp at this time because I thought the mix was very wet. As soon as that maida went in, I thought it was perfect. It was the consistency I wanted. This does feel extremely soft to your hands. You can see that the dough is all flaky. This is the consistency needed for the dough to rise and have a nice texture. For regular badushas, just take a small piece of the dough, and make a ball out of it. Poke a ¾ hole in the middle and set aside. For layered badushas, roll out the dough into a thin layer. This was a little difficult because the maida kept sticking. Use a little ghee or maida to stop it from sticking. Now, when the dough is completely rolled out, brush the dough with a little ghee. Sprinkle some rice flour on top of it. Roll the dough starting from one side towards the other like a log. At each turn, apply ghee and sprinkle rice flour to the dough. When the whole thing is rolled up, take a knife and cut the log into small pieces. Roll each piece gently with your hand. – poke a ¾ hole and set aside. These will be the layered badushas! Now, in a wide pan, add the 3 cups of sugar and 1 ½ cups of water. Mix well and switch on the stove. Let this sugar syrup boil. We are looking for almost one string consistency. When that’s almost there, start frying the badushas. While frying the badushas, please make sure that the oil is in medium. If not, the outside will get cooked real fast and brown up and the inside will be raw! So, make sure you are slow and steady and golden brown! As soon as the badusha’s are a golden brown, lift them up from the oil and move them over to the sugar syrup directly. Let it soak in there until your next set is ready. Take out the badusha’s slowly from the sugar syrup and arrange on a plate. Garnish with pistachios or any other nuts or even saffron threads. Here's one just for you. I'm sending this across as an entry to Priya's Feast Diwali 2009 event. Thanks Priya for hosting. 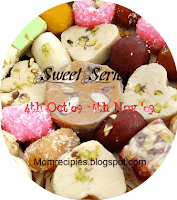 I'm also sending this across to Sireesha's Sweet Series event. Thanks Sireesha for hosting! Also sending this across to Purva's Daawat Diwali Dhamaka Event. Thanks Purva for hosting. Delicious treat to celebrate diwali...Wishing u a happy diwali dear.. I must say that is a great division of labour of love..:)...Badusha looks tooo good. you make it sound so simple ok, though I know getting it right takes practice!..kudos for getting a perfect looking ones..will try this out sometime.. The Badusha recipe has beautiful pictures and is very well presented.I get the FLAVOR,looking at these pictures. FLAVOR = TASTE + MOUTHFEEL + AROMA + "THE X FACTOR". Keep going and compile all these recipes into a glossy covered recipe book. Thank you so much for the recipe. I tried both versions, but layered badusha was perfect , they simply went excellent. Please let me know whether baking powder can be used in place of baking soda? Anonymous- the baking soda is used for puffiness to the badusha. I'm not sure if baking powder will work the same way - maybe give it a try in a small quantity. You can always just skip it totally too. Thanks for trying.